My thoughts for this book don't stray far from my thoughts about the first two books, including my opinion of the story, the world, the concept, the writing style and the characters. So, in order not to rehash too many things already said, I'll just leave it at the fact that, overall, this book was highly enjoyable and a bit more exciting than the second book had been. 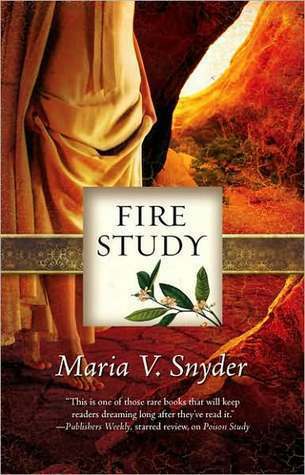 I liked the plot in Fire Study and much of the development. While the second book was kind of "meh," this one managed to amp up the intrigue a bit more. Although, this isn't to say that I won't soon tire of the "Evil Magicians Trying to Gain More Evil Powers Through Bloodshed and Higher Level Wicked Rituals" trope. Just because the details change, doesn't mean the plot device doesn't get old. Hopefully, when the fourth book comes out, we can stand to have a different story plot to follow. As a whole, the series is decently enjoyable. I must admit that as much as I would prefer that the writing style be slightly different (more surprise twists, less predictability, more emotional impact, less rushing forward to the next scene before I can even register what's going on in the present scene), I really have enjoyed all the creativity of the Study series' world. Maria V. Snyder's story concepts and character designs are akin to what I like to read about (and this includes the Healer series that I will be finishing fairly soon). She's got strength in her characters with strong main female and male leads as well as extremely supportive side characters who light up the atmosphere. Friendships are strong, and who doesn't like reading about a small group of close-knit friends bickering at each other all the time? While they weren't the most memorable characters individually, I know I wouldn't mind seeing more of Yelena, Valek, and crew in the future books that are planned. In fact, I may not have fallen in love with him, but Valek was an interesting main male character I wished we could have seen more of through the last two books. Not that I don't love Yelena, but I DID do a mental fist pump whenever Valek finally made his appearances half-way through both Magic Study and Fire Study. Life for Yelena just didn't seem as attractive without him. In other words, as mundane as the pacing and tone of the writing is, I will continue to contemplate reading more of Ms. Snyder's works. At the very least, I know I'll come across kickass heroines and dreamy heroes who work together to save the world without getting in each others' way. I can't help it. I like what I like. And now that the next three books in this series has been announced, I'm interested enough to continue reading on.